Just as a good actor can raise a picture to be better a good actor without being reigned back can make a so-so picture worse and that is what happens in “Big Eyes”, the story of Margaret Keane (Amy Adams) who painted the best selling painters of waifs with huge eyes while her husband, Walter Keane (Christoph Waltz), claimed to be the painter. Waltz has shown that he is an excellent actor and while Walter was charismatic, a ‘salesman’, a manipulator but most of all a liar who invented himself, obviously, the director, Tim Burton, gives him too much freedom, especially in the trial scene. Though he is suppose to be obnoxious, possibly to make Margaret more understandable, he crosses the line. Aside from the question of who did the art, and the bigger question of what is art, the reasons Margaret left her first husband, being strong enough to leave and take their daughter, why she stayed with Walter, letting him take away her accomplish- ment as an artist, as well as all her self-esteem, until two Jehovah Witnesses knock on her door, is not gone into deep enough by the screenwriters Scott Alexander and Larry Karaszewski. 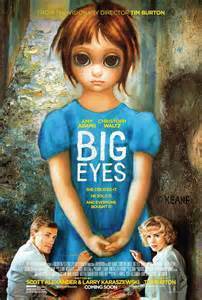 A segment takes place in the building and opening of the World’s Fair in 1964 where I worked in the Gas Pavilion as a waiter and I don’t recall any of what was suppose to have happened there but then except being aware of the ‘Big Eyes’ paintings I wasn’t aware of Margaret Keane’s story. Amy Adams, playing a quiet, single mother of the 50s who doesn’t find acceptance due to the social mores of the time, does a good job and comes into her own with her eyes and facial experiences during the trial scene. Delaney Raye as her young daughter Jane, and Madeleine Arthur as Jane in her teenage years, don’t add anything to the film. Jon Polito, as the owner of the Hungry I, and Terence Stamp as the New York Times art critic John Canaday are standouts.